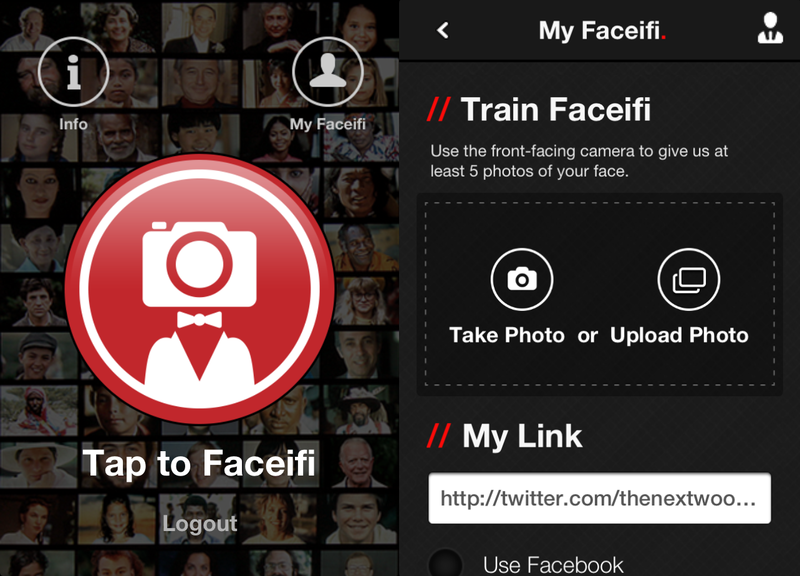 Faceifi is a new UK-based startup backed by Ground Six that allows anyone to upload an image onto its platform to identify the person and find out more info about them. While it’s still in early testing, there is an iOS version available to download and play around with on the iOS App Store, which is exactly what we did. An Android version is also on its way, the company promises. The premise of the system is simple enough: find out more info about a person by taking a picture of their face and run it through Faceifi’s system, but it’s one that dances at the fringes of online privacy, and as such isn’t one that innately sits well with me. For the millions who want to be found, it serves as an opportunity to increase a Twitter following, raise awareness of their business websites or their own personal profiles. Journalists may want to update their link to their blog or latest blog post, whilst celebrities who are the face of brands can literally become the face of those brands by linking to endorsed products online. First of all you sign up either via email registration or using a Twitter or Facebook log-in, and then are prompted to train the system to recognize your face by uploading five pictures of yourself, which can either be taken using the device’s on-board cameras or by uploading a snap you already have on the handset (or on your computer if you’re using the desktop version). While it’s obviously still in testing, it seems that however many pictures you upload, the ‘My Faceifi’ section always tells you to upload more. As well as working for individual people, it’ll also work for groups of people. “The technology also recognizes groups so that a band, for example, can send those who run a photo of the whole band can set a group-link. This might be to their latest album on iTunes,” Faceifi said. The service is incredibly simple to use, meaning there are few options aside of choosing where you want your profile to link, but suffers from the same limiting problem that other seemingly sound ideas suffer from: a lack of critical mass. 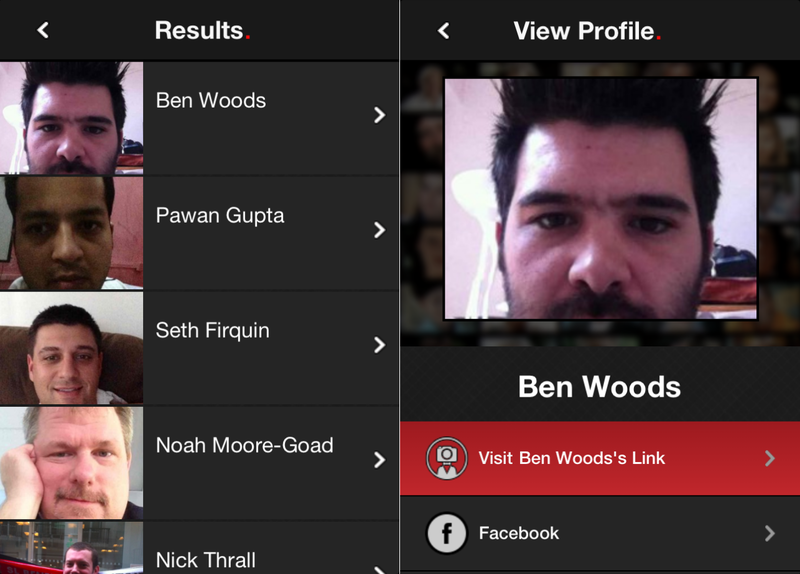 You see, while you can run a picture of anyone through Faceifi to try and find out more about them, you’re going to be out of luck unless they happen to have heard of it, and happen to have set up an account (including taking those five pictures). It might work better for brands and retailers, but for individuals right now, it’s a bust. For example, the numbers of people on the site are seemingly so low at the moment that if you try to ‘Faceifi’ someone, the suggestions it returns might not even be the correct gender, let alone be the actual person you are looking for. However, this doesn’t seem to be a problem with the actual facial recognition (search for a picture of me and you’ll find me, as I did below) but more one of low membership numbers, but that’s to be expected I suppose as the service is still in its fledgling stages. If you do manage to find the person you are looking for, you get the option of viewing their chosen link, or their linked Twitter or Facebook profiles. The company said it’s still gradually introducing features – things like direct in-app messages (which will be opt-in, meaning the user would have to allow others to message them) are due to be added in the next couple of weeks – and another imminent update also promises to bring a short bio section to each member’s profile, which would give some sorely missing context to the user’s chosen link. When someone has ‘Faceified’ you, it would also be good to find out who that was, rather than simply someone had. As Faceifi continues to grow its feature list and become more refined, perhaps it will become a more useful tool but for now, its use as intended is severely limited. Quite how it plans to attract a large enough user base to make it truly worthwhile is currently unknown, but without critical mass, privacy-minded social networks or platforms haven’t tended to survive too well. It’s somewhat of a chicken-and-egg situation. Users might be reluctant to sign up to the service with little immediate benefit for using it, but if it fails to attract new members quickly enough it’s use will likely always remain limited. Read next: Making an obsessive user your company's CEO? Worked for this startup.